I like to read. A lot. 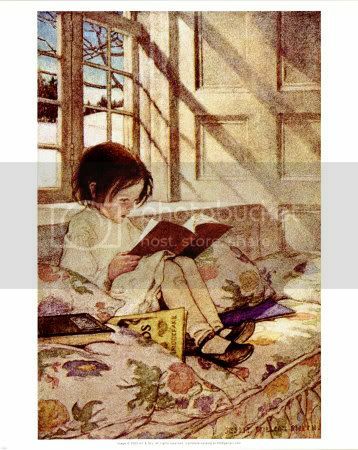 When I was little if my family couldn't find me, they knew I'd probably be reading. (That or sleeping.) During childhood, books were an escape into exotic worlds that were waaaaaay more interesting than Durham, NC. In elementary school I would go to the library and check out the biggest books possible. Ann of Green Gables (as a trilogy), Great Expectations, The Count of Monte Cristo. I'm pretty sure I didn't completely comprehend every single nuance of those stories, and reading that precociously certainly contributed to my mispronunciation of obscure words that were not in my 2nd grade lexicon (chiffon and facade among them), but I can't say I have any negative fallout from being such a bookworm. On the contrary, I think reading most anything (including, ahem Dad, catalogs and mom's magazines) gave me exposure to styles of writing that I've been able to mine during my own career. I'm a decent copywriter because I internalized copy through decades of reading Vogue and Cosmo. Right???? These days, I still read a ton. And my golly gosh, if you want my reading list, then lemme know. It's a long one. TONS of best practices/business/and psychology and self-help at the moment. I also love non-fiction stories about amazing adventures and biographies. If I do read fiction, it tends to be old school and canonical: Hemingway, Fitzgerald, Austen and then I throw in whatever is the new, hot book (like The Help this year or Little Bee last year). Anyway, you can probably tell I love my books. When I was in high school I put my textbooks into my green monogrammed L.L. Bean backpack and had my roommate take them with her to sell back to the bookstore. She returned with an empty backpack and about $60. Not so much over the money (which was not nearly enough for the books I sold back), but over the loss of my friends, my memories, my books. I felt physical pain. I vowed never to sell books back to the bookstore again (with a few minor exceptions like STAT 101). Fortunately, I had kept aside Chinua Achebe's Things Fall Apart because I couldn't part with it and it was in bad shape. I still have it. And love it. In a later post, I'll share my favorite books, my game changers and the ones I will read and re-read for the rest of my life.